Our friends at T3 magazine have been on the cutting edge of tech for more than 20 years, and today they’ve launched a super-modern new design for the magazine to keep them there. The ultra-clean new look is classy, and is paired with more original photography than ever before, as well as new sections and a fresh approach. A big part of the new T3 is that tech now reaches into more parts of our lives. It’s not just about the fastest laptops and phones (though that’s still huge) – everything from electric razors to plug sockets are now online and app controlled. T3’s mission has always been to help you find the coolest tech out there, and now that means showing you how to automate your home as much as it means the latest TVs. 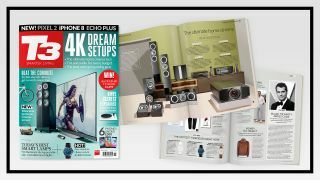 That’s why they’ve expanded their smart home section with more product reviews and advanced home control tips, and created a new opening section that shows not just the latest tech you need to know about, but also the best cars, fitness and travel gadgets that just help make life easier. There’s also a new buyer’s guide, packing 96 of the most important products, so you know exactly what to get when you’re looking for something new. And they still have our real-world reviews, in-depth features and much more – all with a new look that’s easy to read. In fact, you can take a read through some of it below! And they’ve also redesigned their custom-built iPad edition, to make it more fun to read. You can get a FREE trial of that through the app. You can also read T3 on Android devices.